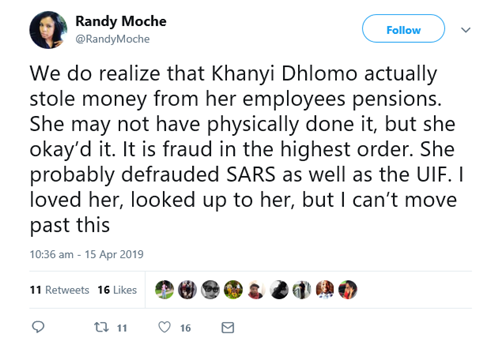 We were all shook to discover the damning accusations about media mogul Khanyi Dhlomo. According to Sowetan Live, sixty former Ndalo Media employees took her to the CCMA. This follows the shut down of several subsidiary publications under Ndalo Media due to financial difficulties last year. Employees were re-assured that their severance packages would be duly paid and that they would have access to UIF and pension funds. However, this has not happened. "I tried to go get my pension and I couldn't. We also want to go to Sars because we believe she wasn't paying our pension, UIF and PAYE, but they were being deducted from our salaries every month. Where was the money going?" asked the Sowetan Live source. 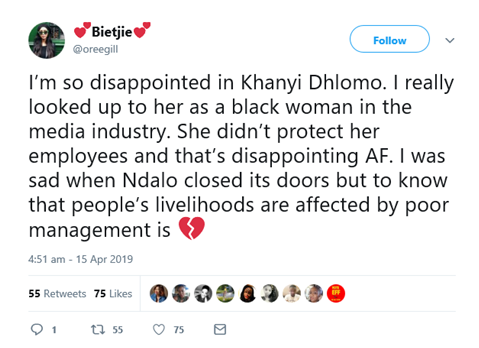 The media mogul liquidated the company as opposed to retrenching workers meaning that employees would only receive what was left after shareholders were paid. It is further alleged that this decision meant employees could end up getting "10c to a rand". Several employees who had been with Ndalo for years were told they could get as little as R12,000. She has not attended any of the CCMA hearings and due to her absence the matter is now being taken to arbitration. Tweeps were very emotional and distraught about the matter. This is what they had to say.